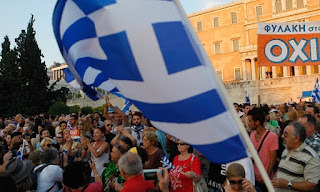 Writing as of late Monday the situation in Greece continues to grow more stark. The on-again/off-again negotiations between the creditors (The so-called Troika of the IMF, EU and ECB) and the Greek government have made no progress toward a win-win situation. Over the weekend the US was intervening to get the parties to work toward an agreement that involved some debt relief for Greece. The unfortunate timing of the announcement from Puerto Rico that it has a similar problem of unsustainable debt probably sidelines the Obama Administration at this eleventh hour. Tonight the sides are forming on a referendum called by the Greek government for the weekend to see whether the Greek electorate will endorse the next round of austerity imposed from outside the country. Prominent voices in the US and Europe have called for the people to vote "No". Some like Paul Krugman have warned for years that a single currency zone absent political integration would end in disaster. Joseph Stiglitz also counsels on his approach to the conflict and his rationale for the vote against the next wave of austerity. Two weeks ago Amartya Sen called on the EU to end its austerity regime aimed at Greece saying that the Keynesian formula of spending in the face of contraction (Greek GDP is down 25% since the crisis began four years ago) is the right one and austerity counterproductive. If three Noble Prize winning economists are saying the approach of the Troika are wrong ... who supports their destructive ideas? As the great summary of the crisis from Social Europe shows, the point of the bailout of the government and the continued assistance to the Greek banks was to help the holders of Greek sovereign debt ... banks in Germany, France and the rest of Europe. Now the Troika largely owns the debt. 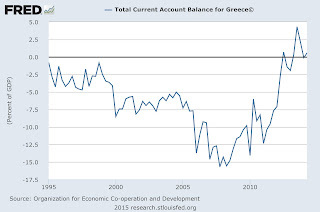 So what the Troika wants Greece to do is contract the income of their people more in order to generate trade and government surpluses to provide funds to pay off the creditors. The fact of the matter is many of these institutions made poor business decisions and now the Greek people are asked to pay the bill. The Troika wants the Greek government to continue to commit Macro malpractice after a generation of Germany (and other export driven economies) allowing Greece to import significantly more than it exported in order to enrich Germany (and other export driven economies) which expanded the nation's indebtedness. 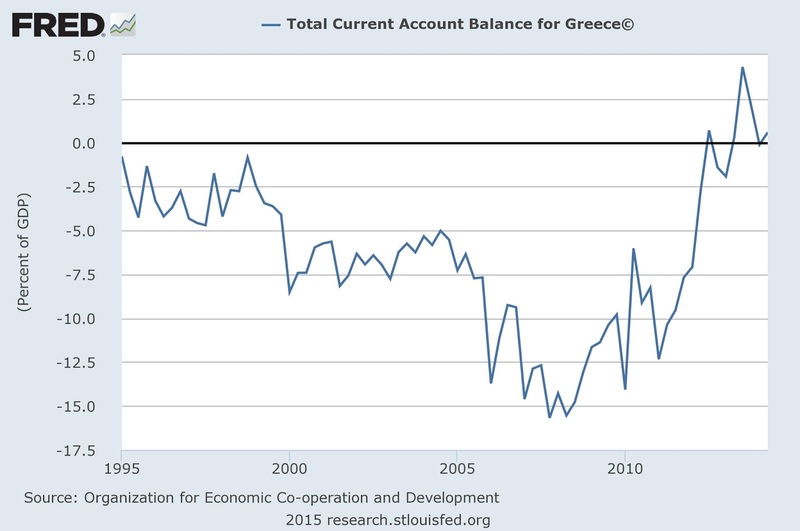 Today Greece has eliminated its current account deficit and so is near to running primary government surpluses. However, this level is not enough to repay the creditors. So what is to be done? The answer is to leave the Euro with all the risk and confusion that will entail. With its own currency Greece can devalue its debts. It is the path that allows Greece to control its future and have some hope of generating economic growth and prosperity. The question becomes to what lengths will Germany, and the other European powers-that-be, go to prevent Greece from charting its own future and self revaluing its debt? One hundred years ago the world was in the engulfed in the first of the three great European wars of the 20th Century. Starting in 1914 the First World War reached out of Europe to include Africa and North America in its insane grip. Millions died in the war and its indirect misery and the stage was set for the second and third (Cold) wars where the impact grew across the globe. In the U.S. The milestones seem to flow by with little note. The sad anniversary of the sinking of the ocean liner Lusitania was in May. Perhaps a wreath bobs on the ocean left by someone connected to the event. Thankfully the British have taken one modest step to remind us of the origins and impacts of the war to end all war. 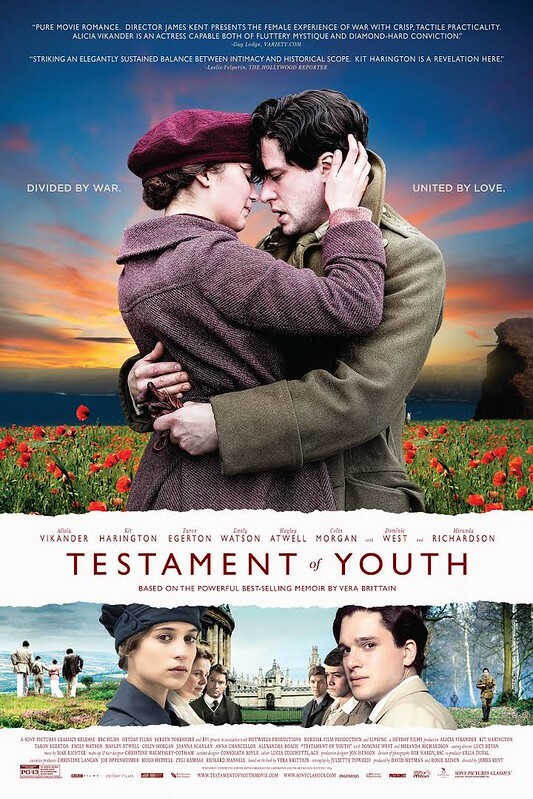 Last fall a new feature length film version of the heart wrenching memoir, Testament of Youth was released theatrically in the UK. This weekend it finally made it to Boston. For those of us familiar with the work by the pacifist campaigner, Vera Brittain, the opening scenes of the idyll of the British countryside and the young people engaged in their last flirtation before the war fills one with dread. The film, as the book, pulls no punches in its depiction of the hubris of the British public thinking the war will be brief and impact less. When I read that the filmmakers were redoing the story and eventually recast the lead to be Alicia Vikander I was a bit concerned. Could a young actress from Sweden capture the proper spirit of the strong headed woman who would make such a mark on generations to come? The 1933 book took on a renewed life in the late 1970's through an epic telling on the BBC with Cheryl Campbell as the lead. In the new film Vikander shows the talent that promises to make her a giant in international film. Given a spare script, she leaves no doubt on her angelic face of the range of emotions that young Vera experiences and she goes from rebellion to love to loss and then rebellion again. She is paired with the equally beautiful Kit Harrington as her fiancé Roland Leighton. He, like her brother and their cohort of friends and school mates, march off to war with the care free bravado seen in other films of the era, Doctor Zhivago or Nicholas and Alexandra come to mind. They return in a way that killed that innocent Edwardian idyll and has left the world with a set of problems we have not transcended across the century. Vera loses all she cherishes on earth during the war but gains a self which the film allows us to glimpse. The text crawl at the end could not possibly do justice to the importance she had as a writer and graduate of Oxford who dedicated herself to trying to make the world a more peaceful place. The story has haunted me for nearly forty years. Hopefully one hundreds years from now someone will write about how we have better learned the lessons she was trying to teach us. Not romance but practically that these foolish wars, which we still insist on fighting, makes us less safe and secure. And that their prosecution changes us and not for the better.